Known for their harmonic blend and versatility, the dynamic Mantini Sister trio of Sandra, Barbara, and Ann have been captivating audiences across Canada and the United States for 20 years, although the fans of Niagara-on-the-Lake, Ontario deem the entertainers "their own." The seven Mantini children may be heaven, with three being music to many ears. Discovered by famed director of Canadian Theatre, the late Alan Lund, the Mantini Siters' act went from St. Catharines' community based theatre to the professional stage of the Charlottetwon Festival in Prince Edward Island. In 1985, the Mantinis were featured as solo artists and then formed the "trio" for the Festival's production of SWING! - a revue of the Big Band era. Thus the Mantini Sisters were born, and established. 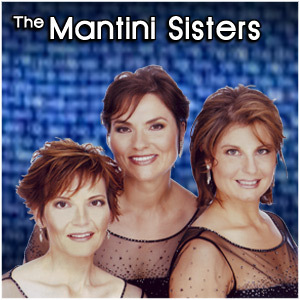 Since 1997, the Mantini Sisters have been touring across Canada and the United States with the production of "Moments to Remember." Staged and choreographed by Caroline Smith, and musically arranged by Howard Cable, Moments to Remember was first performed at the Stirling Festival Theatre.With the success of their first show, the Mantini Sisters once again collaborated with Caroline Smith and with Music Director Mark Camilleri to stage "The Ladies of Broadway", a tribute to the leading ladies of the Broadway stage featuring music from the likes of Gilbert & Sullivan, Gershwin, Rogers & Hammerstein, Cole Porter and Andrew Lloyd Weber. The Ladies of Broadway previewed in April 2001 at the Stirling Festival Theatre.